Q: US President Trump said on Twitter yesterday that China, along with Russia, is playing the currency devaluation game. What is your response to this? A: We have taken note of the relevant report as well as the relevant content of the twice-a-year report recently issued by the US Treasury Department. It seems that the message released by the United States is a little bit confusing. We will remain poised. 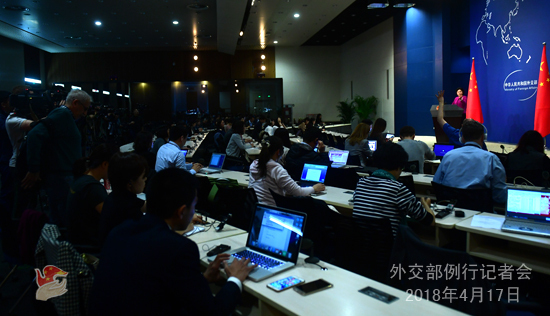 Whatever other people say, we will steadily press ahead with the reform of the RMB exchange rate formation mechanism. Q: It is learned that China and Japan agreed to hold the 9th round of the High-level Consultation on Maritime Affairs in the first half of this year. Have you nailed down the time, location and topics for the Consultation? A: As agreed by the two sides, the 9th round of the China-Japan High-level Consultation on Maritime Affairs will be held in Sendai, Japan from April 19 to 20. Officials from departments of foreign affairs, defense, maritime law enforcement and management of the two sides will attend the Consultation. The mechanism of the China-Japan High-level Consultation on Maritime Affairs is a comprehensive one for communication and coordination on maritime-related affairs. China looks forward to having an in-depth exchange of views on maritime-related issues with the Japanese side so as to strengthen mutual understanding and trust. Q: The US Commerce Department has blocked US companies from selling components to ZTE for alleged violations of trade sanctions with the DPRK and Iraq. Would it be fair to view this as another skirmish in the looming trade war between China and the US? Would it be correct to characterize technology as a major battleground in the trade dispute? A: China's Ministry of Commerce this morning already responded to the US Department of Commerce's announcement of export control regarding ZTE, and I believe you may have noted that. 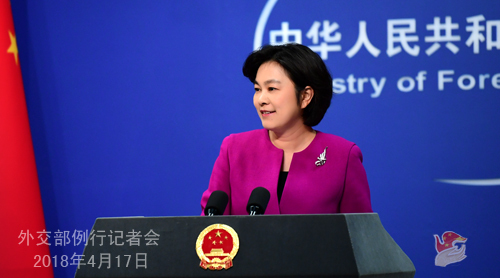 China will closely follow the development of this case and we are ready to take necessary measures to safeguard the legitimate rights and interests of Chinese enterprises. As to the trade frictions triggered by the US Section 301 investigation, we have stated China's position clearly and resolutely on many occasions. The actions of the US constitute typical unilateralism and economic hegemony. Both China and the US are major countries in the world, and our economies are highly interdependent, which means that we should respect each other and treat each other as equals for win-win cooperation. You may have noted that recently members of the international community have kept calling on the US to respect the WTO and follow multilateral rules. An increasing number of American people, including 107 business and trade associations have come out against such behavior that is self-defeating as well as harmful to others. If the US continues to act in an arbitrary and reckless manner against the trend of the times, we will be ready in full battle array, fight back immediately and fight to the finish to win the defensive battle for multilateralism and free trade. This is not only for safeguarding China's legitimate rights and interests but also upholding the global multilateral trade system and rules. Q: Do you have any comment on the visit by the Taiwanese "President" to Swaziland tomorrow? Is the planned military exercise a response to this? A: I must correct your mistake because what you said is wrong. There is only one China in the world. Taiwan is an inalienable part of the Chinese territory. What you mentioned is the head of the Taiwan region. I only want to stress that there is but one China in the world. This is not only an objective fact and common sense but also the general consensus of the international community. Q: Recently Japan and India expressed their support to the rules-based multilateral trading regime and the global free trade system with the WTO at the core respectively during the 4th China-Japan High-Level Economic Dialogue and the 5th China-India Strategic Economic Dialogue. Many heads of state and international organizations have also voiced similar opinions. Does this suggest that China has won the support of a number of countries against the backdrop of possible exacerbating China-US trade frictions? A: We have clearly stated China's position regarding the China-US trade frictions on many occasions. As I said just now, the current China-US trade frictions regarding the US Section 301 investigation are in essence a fight between multilateralism and unilateralism, and global free trade and trade protectionism. As President Xi Jinping pointed out while meeting with Executive Chairman of the World Economic Forum (WEF) Professor Klaus Schwab yesterday, there are so many problems and challenges in today's world, which calls for equal-footed consultations and strengthened multilateral cooperation. History has repeatedly proved that isolation can only lead to a dead-end alley, and only opening up and cooperation can make the road wider and wider. Major countries bear important and special responsibility in this respect. 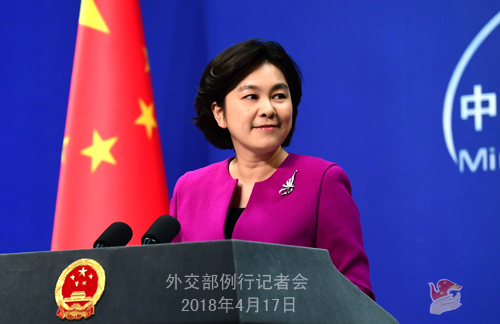 As a responsible major country, China will cooperate with other members of the international community in opening up and seek win-win outcomes through cooperation, and play an active role and make more constructive contributions in bringing bright, stable and promising prospects to the world.